The campaign is in full swing. Last Tuesday, the Malawi Electoral Commission (Mec) declared that the 60-day campaign period can commence and, as I am writing this, it is all systems go. The contestants will do everything to come out victorious on May 21 as they conduct rallies, launch manifestos as well as engage in new alliance talks as we have seen this week when Malawi Congress Party (MCP) hit it with People’s Party (PP)’s Joyce Banda with the news that she will now support Chakwera. Theirs is a loose arrangement because it is only at presidential level. From this point to May 21, we will see parties conducting more rallies than before to talk to the masses. However, what we will not see is the voter talking back for the contestants to, first of all, account for their actions and promises as well as enabling the masses to tell the leaders what is on the mind to improve their lot. That is why some civil society organisations plus media houses are organising debates and other forums to have a chance to talk back to their leaders by asking them questions in a controlled environment. Interest groups such as Media Institute of Southern Africa-Malawi and Federation of Disability Organisations in Malawi are taking the lead. Unfortunately, the ruling DPP announced two weeks ago that its presidential candidate President Peter Mutharika and his running mate Everton Chimulirenji will not take part in any debate saying the party has reservations on the integrity of those behind the organisation of the same. But chairperson of the task force organising the debate Tereza Ndanga said her organisation will continue engaging DPP as well as the President to make him change his mind by humbling himself and joining the other candidates on March 29 in the first of the three debates lined up for all presidential candidates. The President must reconsider his stand. Mec has emphasised the fact that all nine candidates are equal and must be treated the same by stakeholders including those organising the debates to make sure that they help in the democratic process and not be a hindrance or detraction to the same. These candidates are looking for a job—fighting for one job—and Malawians are essentially calling them to an interview. It does not make sense for any candidate to shun the interview from the owners of the job and then hope to get it at the end. There has been an attempt by some leaders to feel big and ignore calls of people in name of debates or meetings with special interest groups. The President must remember that, in 2014, Joyce Banda ignored the presidential debates just like her running mate Sosten Gwengwe, who only attended one in Lilongwe and ignored the other in Blantyre. This year, DPP running mate Chimulirenji has shunned the debates. But I say this is wrong because Malawians want to hear from their candidates in an environment where the candidates are not in control to see what they can say and be ready to defend their record. Those who feel big and refuse to humble themselves are saying Malawians can go to hell, yet, on May 21, they expect the same Malawians to vote for them, which is a total contradiction. The debates will be watched by millions of Malawians, eager to see and hear what their leaders will say and who deserves their vote and has plans to safeguard their futures and that of their children. History, I repeat, shows that it does not end well for politicians that think they are big and do not humble and avail themselves to be quizzed on relevant issues by the people of Malawi. The President and his running mate are incumbents and are every day defending their record. Mutharika wondered, tongue-in-cheek, in Karonga the other week whether his opponents, who say he has done nothing to take this country forward, live in Malawi, where he claims he has done tremendous development. Malawians hear this every day and some of them agree with this assessment while many others disagree with the President. Those that do not agree with the President want to challenge him in the face because they are of the view that Malawi is on a wrong development trajectory and that nothing is happening on the ground, with poverty levels getting worse by the day. It can only happen if the President, who claims to be a democrat, allows this interaction. Let us, for a moment, agree that, indeed, Malawi is on the right trajectory as the President passionately claims. But then if that were the case, why should it be difficult for the President and Chimulirenji to go on the mountain top and proclaim it on top of their voices without being afraid of attacks by the opposition even during debates? What are they afraid of? I repeat. The President should reconsider his stand and not follow blindly the example set by his running mate who has already ducked any meeting called by Malawians to make him accountable for the DPP promises in 2014. It must be remembered that Mutharika in 2014 braved the debates and he was among the 11 candidates that battled it out and, at the end of that process, he became the winner. He should set an example to the rest of the candidates on the art of humbling themselves to submit to the will of Malawians from whom they want their votes come May 21. The President should change his mind and shame those that have already started making bad jokes tagging him as a coward who is afraid of facing up to political opponents. Mutharika must stop listening to bad advisers who are telling him that he will get embarrassed and concocting lies that those organising the debates have integrity issues because they are not naming and describing the matters that they are talking of bordering on poor integrity. It is more or less the same organisations that organised the debates in 2014 which the President ably participated in and, at the end, came out as a victor. What has changed this time to warrant his change of mind? The President and his running mate are dead wrong as these debates are watched by millions of Malawians eager to listen and critique the plans their presidential candidates have to uplift them from their poverty and improve their lot in meaningful ways. In conclusion, I will repeat what has become my mantra. 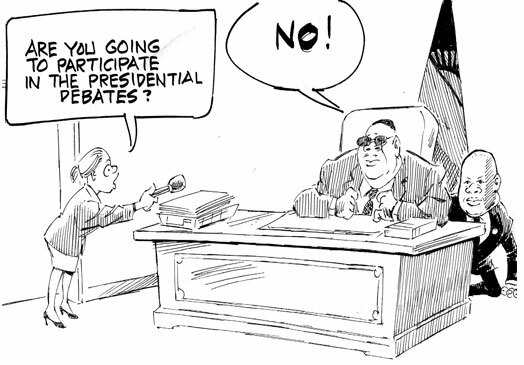 Malawians do not want to hear about rocket science from their candidates. Neither do they want to hear about how planes are manufactured in Europe or America by Boeing and Airbus. What they want is that their candidates should be placed in a controlled environment and be subjected to questions they have no control over on issues that affect Malawians. And what affects Malawians are simple things such as their poverty versus rural economy, agriculture, health, social welfare – the list is endless.